While many folks in the coffee industry are traveling to attend the SCAA Conference in Minneapolis, MN, Braden, Emily and I made a road trip to the Batdorf and Bronson Roastery in Atlanta, Ga. This coffee business thing is complicated, as is any business, -competition, conferences, quality, trends, technology, management, customer service, marketing and profits. As a small, independent business we are always evaluating opportunities, strategies and experiences that best fits into our vision of becoming one of the best coffee houses in Pittsburgh – what gives Tazza D’Oro and all of our staff the best opportunity to excel and succeed. After much discussion, we decided what us best for us was to travel to Atlanta for more intense training and experience with the folks who roast our coffee every week. Emily and Braden spent the day watching coffee being roasted, attending two different coffee cuppings, learning and experiencing the other side of the business that directly impacts what we produce and serve at Tazza D’Oro. 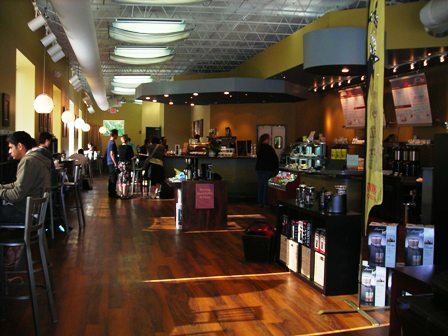 We had the chance to visit the newly opened Batdorf and Bronson Coffee house in Decatur too. BTW, I had one of the best espresso shots EVER. Today was truly one of those WOW days! While Emily and Braden did their thing with Aaron, Eric and Andy I had the chance to meet with Shelia (Operations Manager) and Margaret (Training Coordinator) about vision, trends and potential next steps. Sometime, before the end of May, I will travel to Olympia, WA to continue the discussions with the Batdorf and Bronson folks there. 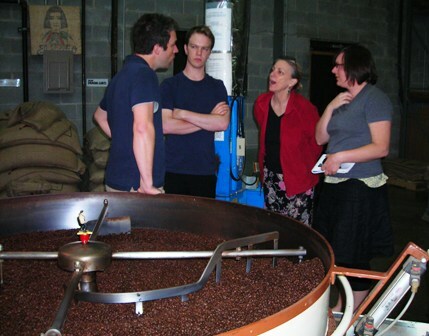 We are really lucky to have such an awesome relationship with such an outstanding roaster. Trying to be one of the best is not only about coffee, but its also about every facet of running the business. Batdorf and Bronson have been great mentors and continue to set the standard for us – on every level. I just have to mention traveling here is a 12 hour car trip. Emily, Braden and I are fine thus far. We head back first thing Thursday morning. The road trip itself could be a whole other blog on personal journeys! Glad you made it out to Hot-lanta! I look forward to seeing you in Olympia soon!